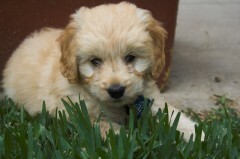 Here are some pictures of our new Goldendoodle puppy named "Coda". We just picked him up on Saturday! What makes him a " minature " ??? His father is a Toy Poodle and the mother is a Golden Retriever. The last litter grew up to be 25 lbs. I saw it! lol but what is done, is done, remember! he's cute. Right on cue. Did my Goldendoodle pics drag up an internet dog snob? (2) The two breeds that have no recessive health traits in common. (4) The pups were carefully socialized for the first 8 weeks of their lives. If my pup causes a few dog snobs to be up-in-arms for the next 15 years, then so be it. It's almost satisfying. 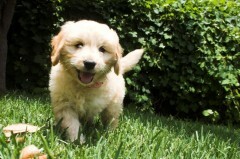 well you could have gotten a golden doodle pup at a shelter, instead of supporting it. just saying. Because then you would have been saving a life. I'm still scratching my head at the thought of a male toy poodle impregnating a female golden. LOL That must have been tricky. Please point me to a local shelter where I could get a genetically healthy Goldendoodle puppy that is properly socialized. My wife searched for weeks and couldn't find one. May I ask why you didn't get a miniature poodle instead? So this great breeder who mixes breeds and health tests didn't have a long wait list? Try pet finder.com There is no assurance on a healthy dog when you go to someone willy nilly breeding their dogs so why not go to the shelter. Its better to support a good breeder of a breed of dog or shelter than support a byb. Hopefully you get lucky with your pup and she is actually healthy. Not everyone is so lucky. My pound gets poo mixes in all the time. They go quick but at least one every two weeks. Yes, we did have to get on a waiting list. We originally started looking 5 months ago. I'm sure that my wife looked through your rescue site. She is going to get the dog certified for pet therapy, and thus felt the need to get the dog as young as possible. Unfortunately, this ruled out most shelter dogs. Hi Travisk... congratulations on your new puppy. Coda's very cute. Hope you stick around Chaz. We have some owners of very lovely mixed breeds on this forum. (Poodle-Lab and Poodle-Golden crosses, as well) While a lot of these dogs are often healthy, beautiful animals, that's often not the case. Hence, the disapproval from many proffessional breeders, exhibitors, rescue/shelter employees and Chaz members who've simply done their homework on the "designer breed" industry and the pit falls of supporting it. As you read more posts on this forum, about breeding, you'll understand the concerns. That makes your puppy no less lovely than a purebred pup or shelter pup though. Glad he's currently healthy, with appropriate OFA hip and Cerf eye checks done on both parents. (Very important with these 2 breeds and rare that someone producing mixed breed pups invests in those tests) Hope to see more pictures of Coda. So be it ! Welcome Coda to the Chaz group . I'll be anxious to see her as she grows up . That's a fairly silly generalization. I had a therapy dog - a GSD/Akita mix, rescued when he was about 5 years old from the pound. MOST of the therapy animals involved in the HABIT program (through the UT School of Veterinary Sciences) at the time were rescues. But I have a suspicion that TravisK is someone who has been here before and only posted this to troll for reactions . . .
And I CAN fix that if necessary. Thank you otch1. I have copies of both hip and eye checks for both parents, so apparently not all of these designer breeders are as negligent as some would assume. Glad you're happy with your pup. Looked at the rest of your pictures. Fun stuff! I see you also bought a Yorkie-poo, so you're not new to this. (Have you been on this forum before, as suggested in another post?) In anycase, good luck with that baby, look foward to more pictures.